The whole Google Analytics dimension is changing after introduction of Google Signals. The attribution will be lot easier, the data unification wont be a myth for client ID users, and more audience targeting options. I logged into my Google Analytics account to watch my blog performance like every other day. But, today I got this blue color band in top saying “Introducing Google Signals” in BETA with Get Started call-to-actions button. I searched for articles, but couldn’t find any news or update on the same. Hence screen captured the steps and posted on YouTube. The option to activate Google signals will be rolling out to all users in the coming weeks. If you don’t see it now, you will soon. On hitting the “Get Started” button – I was navigated to Google Signals introduction page. This page will describe all the feature associated with Google Signals and what are capabilities you’ll be receiving once it’s activated. Hit on Continue button for navigating to Activation page. Before activation, it will check whether the pre-requisites are met. Also, it will ask to which all properties in an account should be activated with this Google Signals tab. Default it’s set to all the GA Web Properties, but you can change your selection on the confirmation page. After continuing confirmation, you’ll finally land on Activation page and hit on the “Activate” button will enable the Google Signals capability in your Google Analytics. 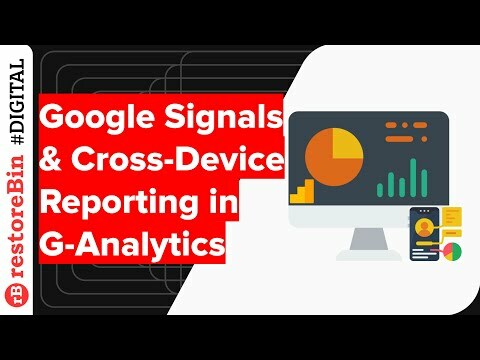 In this video, I walk through about how to activate the Google Signals and also the access the Cross-Device audience reporting. The Cross-Device is a new addition along with Google Signals that give an idea about how the users are behaving across devices. It basically uses the Google Account credentials to map the users cross-device. Users also need to enable the Ads Personalization option to have this feature and receive enough data to report. You can learn about these individual cross-device reports in the support center. I think it’s a wonderful addition to the Google Analytics reporting capability. We can now access and understand how a user is behaving on mobile, tablet and desktop differently. I also feel this is just the beginning of cross-device analytics, there are more to come in the future. What do you’ve in your mind? drop in below comments and let us discuss further. Also, learn why you should switch to Users metrics reporting vs Sessions in Google Analytics. If you've any thoughts on Google Signals: enhancement in cross-device tracking and audience targeting, then feel free to drop in below comment box. Also, please subscribe to our restoreBin YouTube channel for amazing videos tips. Cheers!